This month’s roundup of leading solar innovations and breakthroughs in solar technology highlights two innovations at established solar equipment and module manufacturers that have real near-term potential to boost sunlight conversion efficiencies for crystalline solar cells – with albeit incremental gains. Also explored is a new record efficiency for an organic PV cell. How it works: PV manufacturing equipment supplier GT Advanced Technologies in mid-March announced a new “flexible grid” metallization and interconnect technology targeted at solar cell producers. Marketed under the name “Merlin,” the production line add-on can be integrated into existing solar cell manufacturing lines, enabling producers to replace the traditional three silver bus bars on solar cells with thinner grid fingers. This produces less shading on a solar cell – meaning that more sunlight can be absorbed by the active crystalline-silicon semiconductor material and converted into electricity. What it promises: According to GT, the manufacturing technology has the potential to cut expensive silicon paste used in the production of crystalline solar cells by up to 80 percent. It also can eliminate the need for cell stringing and tabbing machines used to produce modules – further reducing manufacturing costs. Eliminating shading has the potential to improve the efficiency of conventional crystalline PV cells. The New Hampshire-based company claims that modules made from cells relying on its Merlin technology will be more reliable and durable because the new flexible grid structure is more resistant to cell cracking. Commercial arrival: In an investor presentation on the technology, GT said a pilot manufacturing line equipped with Merlin went online in the second half of last year. It expects to receive certification for its first Merlin-equipped commercial manufacturing line in the second half of this year at an undisclosed location, with commercial activity commencing in 2015. Given GT’s long track record of introducing new PV manufacturing technologies for conventional crystalline silicon cells, Merlin’s chances for commercial magic are good. How it works: Researchers from Chinese crystalline silicon producer Trina Solar and ANU’s Centre for Sustainable Energy Systems have developed a so-called interdigitated back-contact (IBC) silicon solar cell capable of converting an impressive 24.4 percent of sunlight into electricity. IBC cells are a type of rear-contact solar cell that achieves higher efficiency by putting both contacts on the back of the cell, thus eliminating shading. What it promises: If successfully transferred from the laboratory into commercial production, this could mean that a larger percentage of higher-efficiency solar cells will become available – since Trina is one of the world’s largest PV manufacturers. How it works: Funded by a grant from the European Union, Belgian research institute IMEC International in March presented its laboratory-scale organic solar cell with a sunlight conversion efficiency of 8.4 percent – a record for this type of solar cell. IMEC achieved the record efficiency by stacking three layers of active semiconductor materials that boosted the potential sunlight absorption spectrum. IMEC’s approach does not use fullerenes, which are the most common acceptor material in organic PV cells – which, however, aren’t common at all. What it promises: IMEC’s laboratory achievement is a signal that perhaps organic PV cells shouldn’t be completely ignored in the wake of several commercial failures in recent years – which were in part the result of the technology’s disappointing, low single-digit efficiencies. IMEC is a member of the EU-funded ArtESun collaborative effort to develop high efficiency organic solar cells capable of converting more than 15 percent of sunlight into electricity, along with roll-to-roll manufacturing equipment for this flexible solar cell. Commercial arrival: Although an impressive collection of research institutes and companies are collaborating on this project, the reality is that organic PV cells remain far away from commercial relevance – even if very limited commercial sales of such cells already have occurred. The post Solar Innovation, March 2014: Real-time Efforts to Boost Solar Efficiency Rates appeared first on Solar Power. Another month, another slew of solar innovations! This month, while we’re continuing our ongoing “solar everywhere” theme of explore the many places where solar can go beyond the roof, we’re also seeing an emerging trend: electric vehicles of all kinds. While not specifically solar-powered in most cases, it is only the tiniest of leaps to get from an electric vehicle to a solar-powered electric vehicle. So bear with us: Although it seems like we’re straying from our self-imposed mission, this is how the pieces all come together. Solar bike charger: To start off our roundup and underline our point, let’s look at the new Spark solar charging station (pictured above at left) designed by electric-bike manufacturer Xkuty. Inhabitat reports that the Spark recharging station “doubles as a parking unit and it adapts to almost any environment — it can be easily integrated into houses, buildings and shared spaces.” Sadly, at this point the Xkuty One e-bike — and it’s fancy new charger — are only for sale in Europe. Ford’s electric bike: The Ford Motor Company is also getting into the electric bike game, showing of the new Ford Supercruiser electric bike. Created by Pedego Electric Bikes and licensed and branded by Ford, the Supercruiser is a seven-speed e-bike with a 600-watt motor that goes up to 20 miles per hour, and can carry you between 15-30 miles per charge, depending on your size and how much you pedal. As cool as it looks and as great as it sounds, the price tag will likely give you pause: According to ElectricBikeReview.com, the Supercruiser will set you back $3,595. That’s enough to get you a a down payment and eight months of a lease on a Nissan Leaf — or just about the sweetest non-electric bike you can imagine. The MTT is seen throughout much of the demo video connected to a sled-type platform pulling along its passengers at an undefined, but adequate looking pace. As fun as this looks, what I find more intriguing are the multitude of other uses Martel has found for his invention. The MTT-136 is seen operating on dry land as well as snow, opening up a plethora of additional uses. He pulls logs, goes down stairs, cuts through knee deep snow and pushes a car (a Pontiac Montana in neutral on snow) to show what his creation can do. Although the MTT-136 is still seeking funders to move it to production, it looks cool and hyper-practical, particularly given the snow that has steadily dumped on most of the country this winter. Solar-Powered Healthcare Kit: We’ve seen a number of solar-powered tools aimed at the developing world, all of which promise to make great strides in improving quality of life and potentially helping to improve the environment in those regions. Ecopreneurist tells the story of the Solar Suitcase, a healthcare kit that aims to provide more reliable light for hospitals and field medical workers where lights are either currently lacking or too intermittent to be reliable. The Suitcase, built by the nonprofit WE CARE Solar, includes 40 to 80 watts of solar panels, a lead-acid battery, medical-quality LED lights, a universal cell phone charger, a battery charger for double- or triple-A batteries, outlets for up to 12 DC devices, and the maternity unit comes with a fetal heartrate monitor. So far, WE CARE has distributed 300 Suitcases to 25 countries, but is seeking donations to provide more units to the Phillippines, Nepal and Tanzania. The post Solar Everywhere: Electric Bikes, Sleds and Cars, the Solar Robot & More appeared first on Solar Power. It’s the end of the year, and the news cycle slows down significantly as the year winds down. But even though the news is stocked full of year-end lists, there have also been a good number of interesting solar tidbits — enough to flesh out one last Solar Everywhere for 2013. Read on to see how we’re winding the year down with solar in unexpected place. Solar for smokers: Leave it to France to use solar power to help with the problem of smoking bans. Over at the Energy Collective, Boyd Arnold writes about how the French government is helping smokers cope with a ban on indoor smoking: outdoor solar parasols. Boyd writes: “Their solar-powered parasols create heat from the solar power for those under the parasol, and absorbs the cigarettes. This dual function provides a seamless integration of solar innovation while catering to the needs of smokers and government policy.” The parasols also relieve restaurants and bars of the need to rely on gas-powered heaters to keep smokers warm during the winter months. Solar tents: In the first — and sillier — of two stories this month about solar-powered habitats, Inhabitat points us to Bang Bang Tents, which are designed to help make festival-going or car-camping a little more electrified. The four-person tents “come equipped with a solar panel that can be slid into a pouch on the exterior of the tent. The 5W solar panel trickle charges a lithium battery bank that has a USB charging adapter and can charge most low voltage devices. Use the solar panel and battery backup to charge cameras, phones, or computers or use them to run speakers and LED lights.” At £249.95 (US$415), they’re not cheap, but would certainly help you stand out at the campground. Solar shelters: We often say that solar is a force for good in the world — but usually that’s because solar homeowers save money and reduce their emissions. IKEA, however, has developed flat-pack, solar-powered shelters for use by refugees. The shelters are everything you’d expect from IKEA: quickly assembled, spacious, cleanly designed — and are also powered by the sun. After six months of lobbying, IKEA has gotten the Lebanese government toapprove a test run of the shelters for refugees fleeing the Syrian civil war and suffering in the intense Lebanese winter. Solar lights overseas: Putting the sun to work at night is in some ways the holy grail of the solar boom, since it means the development of affordable, reliable battery technologies. One of the earliest places that solar batteries have taken off is in the solar lights market, and two companies this month helped bring light to regions that desperately needed it. First, the Estonian nonprofit Andakidz sent a team of engineers to the Philippines to provide solar lights to villages devastated and left powerless first by an earthquake and then three weeks later by Typhoon Haiyan. Second, Panasonic has committed to sending 100,000 of the company’s solar lanterns to regions without electricity, and engaged the public and 11 artists from around the world to design paper solar lantern covers as a way of spreading the word about how solar can help meet some of people’s most basic needs. Solar scooters: Solar Tribune offers us a brief glimpse at a new solar-powered charging station for electric scooters, from Current Motor, a Michigan-based scooter manufacturer. The company’s Super Scooters can run for 50 miles on a charge, and are then recharged in about six hours by a solar-powered charging station. Here’s looking ahead to a solar-filled 2014 — thanks for reading! The post Solar Everywhere, Dec. 2013: Refugee Shelters, Ugly Dresses & More appeared first on Solar Power. Last month, we published our first installment of Solar Everywhere, wherein we looked at several interesting and unlikely applications for solar panels. Since then, we’ve kept a weather eye on the news for other odd appearances of solar power. And oh the news did not disappoint. Read on for a glimpse at the far-flung places that solar is going. • Solar iPhones: This is not particularly surprising, but it is pretty cool: Treehugger points us to the Enerplex Surfr iPhone case, which integrates a thin-film solar panel into the back of the phone, recharging your battery or keeping it going while you’re talking or playing Bejeweled or whatever it is you people do with your phones these days. At $70, it’s expensive even for an Apple accessory, but it’s pretty cool nonetheless. The timing on this may be good, since CleanTechnica points us to a recent job posting from Apple that’s looking for solar-experienced engineers — a possible hint that the company is aiming to put thin-film solar on its products in the near future. • Solar desalination: With global warming promising to make wet areas wetter and dry areas drier, there’s no doubt that those of us living in soon-to-be drought-plagued regions are thinking about where our water will come from. Desalination, while currently expensive and technically complicated, is a technology that will hold a prominent place in the near future. And members of the Navajo Nation in Arizona are building a solar powered desalination plant to provide clean drinking water to tribe members — who currently have to drive hundreds of miles to buy drinking water in bulk. • Solar sterilization: In other promising quality-of-life news, a team of researchers at Rice University have created a solar-powered autoclave that can be used to sterilize medical and dental equipment in the developing world, helping medical professionals provide safer care to people without electricity. The team has created two types of machines, both of which use sunpower to boil water quickly, and can then sterilize equipment or human waste, and can also be used for purifying water. • Solar lamp post: In hindsight, this seems genius: Norwegian design firm Kaal Masten has created Spirit, a solar lamp post, storing the sun’s energy during the day and releasing it as light in the night. 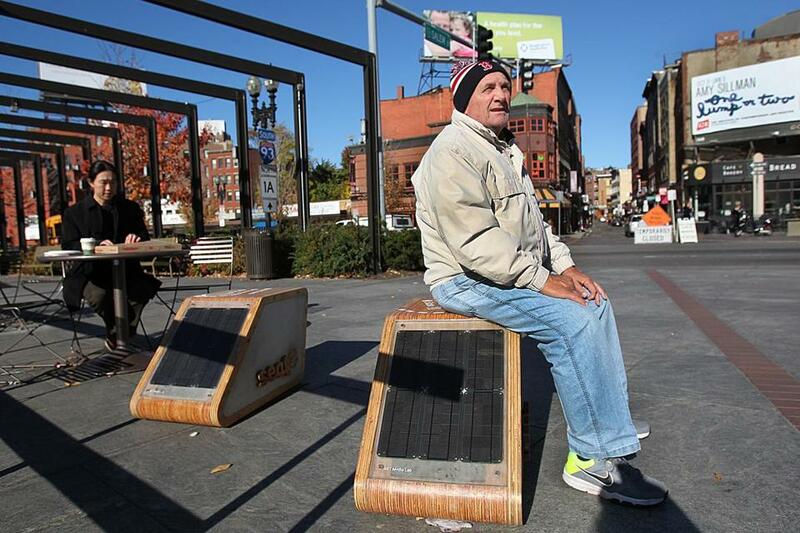 The post is covered with panels and filled with batteries — all of which are recyclable, the group says — and because they don’t need to be connected to the grid, the Spirit light can provide illumination to areas and people that don’t currently have electricity. • Solar-powered transit — buses, planes and tuk tuks! : We’ve all heard about the Solar Impulse, the solar powered airplane that recently completed a cross-country trip (in two months). Last month, Google joined the team as a technology / promotional partner, bringing news about solar-powered flight to the far corners of the world. On the Down Under front, we’ve got two items from Australia. First of all, the city of Adelaide has just turned the keys on the world’s first solar-powered bus. Designed by a New Zealand firm, the Tindo bus is part of Adelaide’s free Connector Bus service. It can carry 40 passengers at a time and travel about 125 miles per charge — it uses a BP Solar charging station at the bus station to recharge. Secondly, the Australian firm Star 8 Solar has developed a solar-powered tuk tuk, the open-air taxis that are used around the globe. Diesel-powered tuk tuks are also major sources of air pollution, leading to restrictions on their use and even bans. Star 8 is putting the final touches on solar-powered tuk tuks that include two batteries, so one can charge while the driver is using the other, and a range of solar panel system sizes and engine capacities. • Solar sidewalk: I was going to be all snarky and put this in the solar-powered transit section, but this is cool enough to be put in its own section. George Washington University has just unveiled an energy-generating sidewalk that uses solar panels underfoot to create electricity. The sidewalk is more art installation / educational opportunity than a utility’s new best friend — it’s just 100 feet long and can generate 400 watts at full capacity, enough to power the LED lights that sit underneath the panels. The post Solar Everywhere: iPhones, Tuk Tuks, Sidewalks and More appeared first on Solar Power.